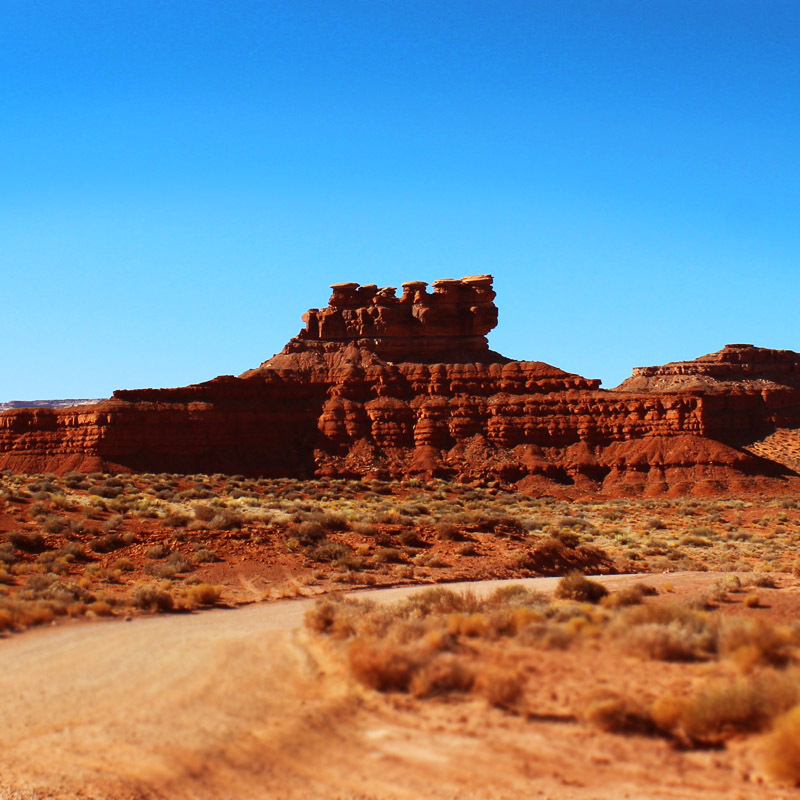 Exploring southeastern Utah is one WOW moment after another. Continuing on from our previous article of the tiny town of Bluff that is surrounded by some of the most interesting hikes, petroglyphs and most recognizable landmarks in the Southwest, today we are taking you on a tour of Valley of the Gods, known as a geological masterpiece. A valley of red sandstone, it is like a smaller Monument Valley with impressive distinct landmarks of buttes, monoliths and pinnacles where water and weather have eroded them into massive, extraordinary, humorous and at times eery shapes and textures. The eastern entrance is west of Bluff on Hwy 163. It’s easy to miss because there is one small roadside sign and the pull-in is on a bend in the road, so look carefully. 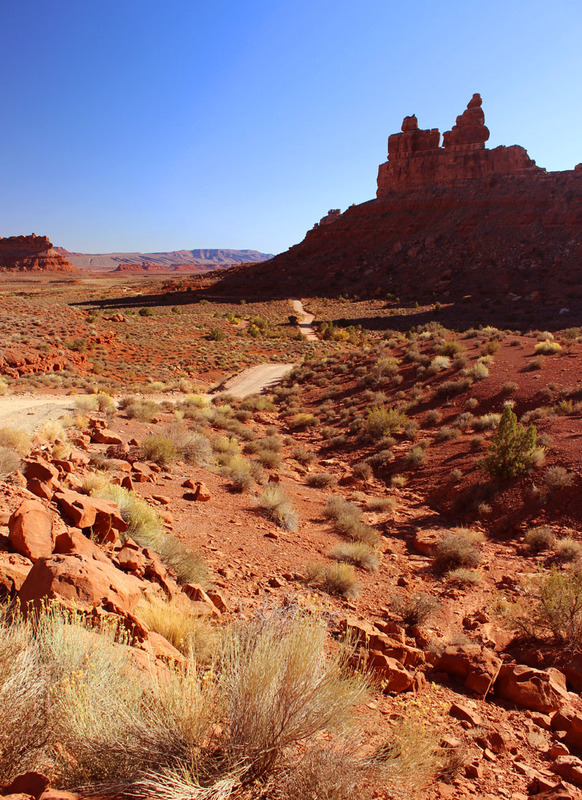 Protected by Bears Ears National Monument, there is no entry fee (at the time of this article) and the 16 mile drive through the valley is on an unpaved gravel road that twists and turns. A high clearance vehicle is recommended, however, a standard car can make the drive in dry weather. After a rainstorm there are runoffs and areas of the road that wash away and become thick with mud. Getting a tow truck may take a while so be sure to check the weather conditions in advance. We went late in the day from 2:30 to 4:30 in late October, and the sun illuminated the red sandstone beautifully. There are pull-out stops for viewing and we stopped at each one to take pictures and then stand in the quiet of the valley where there was no sound but wind breezing across the desert floor. At a slow pace we made the drive in about 2 hours, and loved the moments where we were completely alone and felt as though we were the only people on the planet exploring this rugged beauty. There is a bed and breakfast on the western side of the valley and you can read about them here. 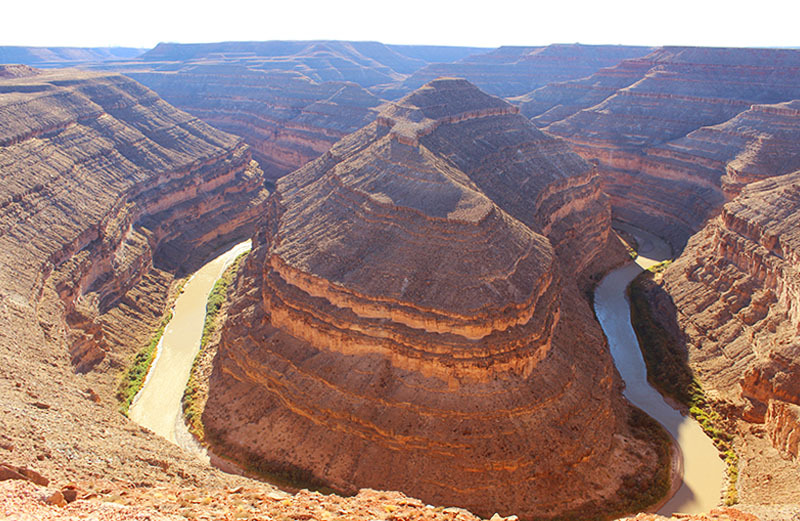 Once you reach the western exit on US 261, consider taking the short 15 minute drive to Goosenecks State Park. Pictured above, you can see the San Juan River winding it’s way 1000 feet below. Also note that we were there close to sunset and the sun was in our eyes. Perhaps earlier in the day is best for viewing with better lighting on the stunning layers of texture. There are other sites nearby so be sure to read about the area attractions as you make your plans. 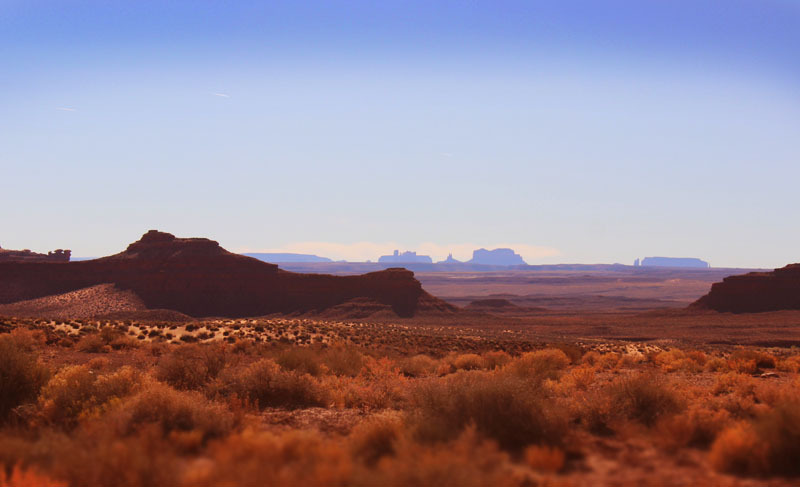 So close to Monument Valley, you can see it in the distance from Valley of the Gods (pictured above). The best time to view Monument Valley and The Mittens is mid-day to sunset. We set out for that discovery the next day and will take you on that majestic tour next week, via the Forest Gump Road. There are no restroom facilities or gas stations inside the valley. Notes: Several hotels and restaurants are seasonal in Bluff, may have odd hours and some close for the winter. Be sure to always check online or call ahead. Also check for weather conditions before setting out. Temperatures in this area can climb into the triple digits in the summer and become freezing cold in the winter. Sand storms are known to blow in with little warning. LODGING: We recommend lodging at Bluff’s Desert Rose Inn and Cabins or Valley of the Gods B&B, and if you are on a strict budget and don’t plan on spending much time in your room then the Kokopelli Inn is very affordable and clean. There is also lodging in nearby Mexican Hat, and at Monument Valley. DINING: Bluff: We had a great dining experience for outdoor grilled steaks, seafood kebabs and pie at the Cottonwood Steak House. Breakfast at Twin Rocks Cafe is down-home no frills deelish. For sandwiches, salads and more pie we liked the Comb Ridge Bistro. We’ve also heard that Duke’s Bistro (a dry establishment) at the Desert Rose Inn has a fine menu. Also, if you like wine and spirits, the closest liquor store is a 2 hour drive in any direction from Bluff, and the closest thing we found to a grocery store was the K&C convenience store in the gas station. If we are leaving out any good tips, please leave them in the comments below. Thanks! MUSEUMS: We’d like to point out two museums to help understand the history of the area. Bluff Fort Historic Site: The original Bluff Fort has been rebuilt and contains an original cabin, the Barton Cabin, which can also be viewed. You can also learn about why the pioneers came to Bluff, and visitors get a glimpse of what life was like on the San Juan in the 1880’s. Edge of the Cedars State Park Museum: Located thirty miles north of Bluff in Blanding Utah, view the largest collection of Ancestral Puebloan pottery on display in the Four Corners Region and explore authentic Puebloan village ruins behind the museum. You can also learn more about petroglyphs and their possible meanings – this is a museum not to be missed when in this area. Tip: While viewing the outdoor ruins, look all around to the landscape / horizon line and notice all of the landmarks visible from where the village stood on high ground. Stew, right on! We see you share our great affection for Valley of the Gods. This is so bucket list! Fabulous! Fabulous, yes! Around every turn, another bucket list moment! The most beautiful land in the world. Looking forward to Monument Valley. Toad, we could not agree more. One bucket list moment after another. Did you stay at the B&B? We did not stay at the Valley of the Gods B&B, they are very popular and were totally booked. Probably a good idea to make your reservation as far in advance as possible. We have heard all great things about them. LK, it truly was. These are places you never forget and want to revisit many times over. Thank you for the beautiful photos and tip on getting a map before taking the tour. Looking forward to your Monument Valley coming up! Stevie, it was like driving through mother nature’s art gallery. If you go please send pics and we’ll share them with everyone. WOW WOW WOW! Just WOW! 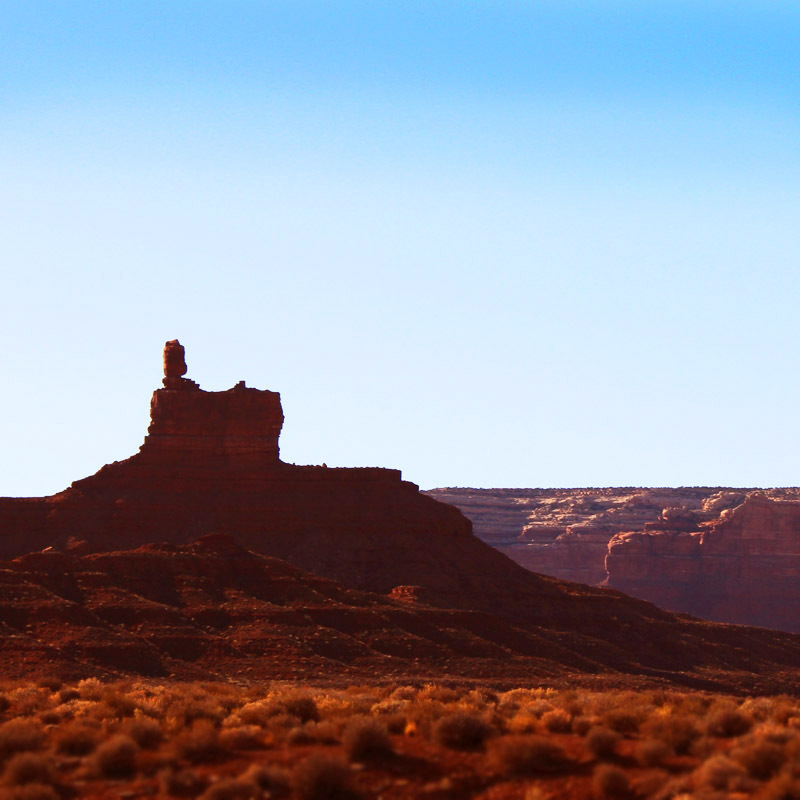 What a beautiful pictorial of the red sandstone rocks and buttes. 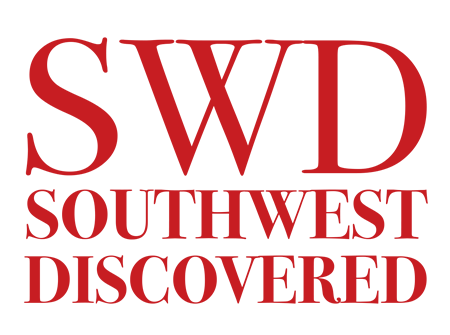 The Southwest is truly an amazing and beautiful place, and I have to put that on my bucket list of places to visit. June, it was also on our bucket list. So glad you’ve got it on yours. Another bucket list is coming up next week — Monument Valley.